Pumpkin Cupcakes, A Yummy Halloween Treat! This recipe just absolutely makes my mouth water! As far as that goes, most recipes made with pumpkin make my mouth water. Pumpkin is just so darned good for you! I could rave about pumpkin all day, but I will spare you. Let’s get on with the recipe! Line your muffin pan with paper liners or spray with non stick vegetable spray. Using a medium size bowl, combine all you dry ingredients and spices except the sugar. Whisk together. In your mixer, combine 1/2 cup of butter and granulated sugar. If you are using salted butter, omit the salt from the recipe. Beat together until creamy and smooth. Add eggs and beat into butter/sugar mixture one at a time. Beat in the vanilla extract. Make sure everything is well mixed. Add the dry ingredients to the mixture alternating with the pumpkin. In other words, add a little dry ingredients then some pumpkin, then more dry ingredients. keep doing this until everything is mixed together, about a third each time. Mix the flour in at a lower speed so you won’t be wearing it. Increase speed as flour mixes in, scraping down the sides every now and then. Scoop the cupcake batter into muffin cups equally. Place in preheated oven for approximately 18-20 minutes, or until an inserted toothpick comes out clean. Cool completely on cooling rack. Place the room temperature butter and cream cheese in the mixing bowl. Beat until smooth and creamy removing all lumps. Mix in the vanilla extract. You can also use orange extract instead of the vanilla as well as some orange zest. Add your sifted powdered sugar to the mixing bowl. Start mixing on low speed and gradually bring it up as the sugar mixes in. You want your frosting to be a light, fluffy consistency. If it is too thick add a little milk or cream to thin it out. If it is too thin add some more powdered sugar. Use small metal spatula or piping bag and tips to ice your cupcakes. If you like more icing on your cupcakes you can double the recipe above. If you are using vanilla extract add toffee chips on top of your iced cupcakes. 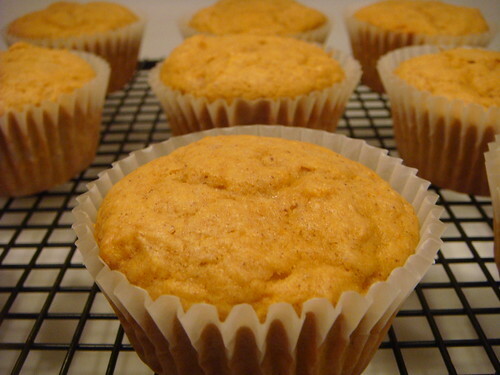 If you are using orange extract add a bit of orange zest to the top of your cupcake icing. Enjoy these pumpkin cupcakes this Halloween. The kids will love them! These look wonderful and would be a scrumptious breakfast. I still have canned pumpkin left over from last year – hope it’s still good! I still have pumpkin puree in my freezer as well. I whipped it up in the Cuisinart food processor last fall. Speaking of breakfast, I may have to try and whip up some pumpkin waffles sometime. I’ve never heard of them, but they do sound good, and healthy too! These pumpkin cupcakes are to die for! Thank you for the recipe and video! I especially love the cream cheese icing on them, Pamela.